← Sennight a dialect word? A couple of weeks ago, we discussed the subject of opening and closing formulas in the MA Linguistics course The Sociolinguistics of Late Modern English Letters. We learned that there are set rules for such formulas and that writers barely deviated from those rules. That we are Your Servants wherever we go. One instantly notices that this letter is written as a short, colloquial sounding poem. The second line “O’re a Glass of Wine” sets the scene: John, Ann and William are enjoying a glass of wine on a warm summer evening and decide to send word to their mutual friend Mary Bellenden and Mary Lepell, another Maid of Honour. This gives the letter/poem its light and amicable tone. Let’s have a look at the opening and closing formulas. The opening formula is actually formulated as was expected in these days: “My Dear Belladine” shows no uniqueness as far as the formula goes. It is worth noting, though, that Mary is addressed by her nickname Belladine. There are two reasons I can think of why they would have used her nickname: they either knew her very well and therefore named her Belladine all the time; or, it was for the sake of the rhyme with the next sentence. However, a quick Google-search confirms that Mary Bellenden was called Belladine by friends (Crocker 1824), so a combination of these reasons seems very likely. Looking at the closing formula, we can see that the style is very different from what we are used to from those days. To me, it seems a poetic version of the standard formula ‘I am/ Your Humble Servant’, since the last sentence says “we are Your Servants”. The last part of that sentence, “wherever we go”, might be a reference to the fact that the trio was traveling to the Continent at the moment this letter was written. I have not been able to find more instances of such free interpretation of opening and, especially, closing formulas yet, however, perhaps someone has found similar instances in other letters? Crocker, John Wilson, ed. Letters to and from Henrietta, Countess of Suffolk, and Her Second Husband, the Hon. George Berkeley: From 1712 to 1767. Vol. 1. London: John Murray, 1824. Gay, John. 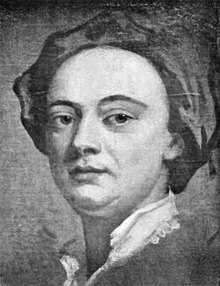 The Letters of John Gay. Ed. C.F. Burgess. Oxford: The Clarendon Press, 1966. This entry was posted in 18th-century letters, letter writing and tagged John Gay, letter formulas. Bookmark the permalink.